EL CAJON, Calif. (KGTV) -- One of the El Cajon Police Department’s K9s, K9 Jester, is being assigned a new partner after his current partner resigned from the department. After working with Jester for the last two and a half years, Officer Jordan Walker voluntarily resigned to work for another agency, according to the department. Walker said he offered to pay for Jester, who was brought in through a Ben Roethlisberger Foundation grant . K9s cost anywhere from $8,000 to $18,000 to bring in and train, according to the foundation. Because Jester is still in excellent health, he was assigned to work with a new partner, Officer Randall Gray. Gray and Jester have already started the bonding process and training together, the department said Thursday. Once the pair completes the academy, Jester will again resume his service. El Cajon police Thursday tweeted out a photo of Gray and Jester together. In an emotional social media post, Walker said in part Thursday, "I was hoping and praying to get to take Jester with me, but in reality it was wishful (and selfish) thinking." Fans created a petition online , quickly garnering thousands of signatures, urging the police department to reverse their decision. 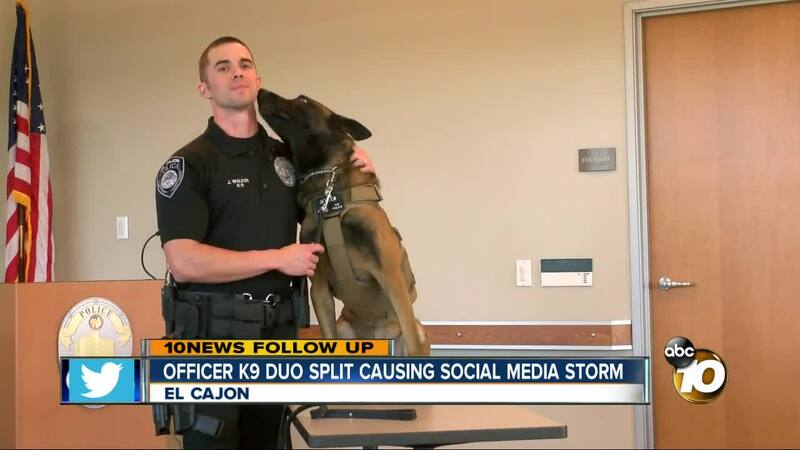 In the statement , El Cajon PD said it is not uncommon for K9s and their handlers to be separated, "if their current one leaves the K9 Unit because of a promotion, divisional transfer or separation from the Department." Walker created the social media account after noticing Jester had an entertaining personality. The account currently has 219K followers. Well...it makes me sad to post this and i never thought i would be saying this, but unfortunately it’s the end of the road for me and Jester. I created this ig for Jester to show how special and funny he is, and in a way to show that police dogs are dogs too. It was me - Jester’s handler that ran the page, took the pics, etc. I made a personal decision I don’t expect anyone other than those that actually know me personally to understand. The decision was to leave my current department and go work elsewhere. I was hoping and praying to get to take Jester with me, but in reality it was wishful (and selfish) thinking. Jester is only 5 years old, and even though we’ve spent nearly every day together for the past ~3 years, he still has lots of work left in him. He is an amazing working pup. He’s done a ton of good for the city, and I can’t say how lucky I am to have been able to work and play with him the last few years. I was given an opportunity that people dream of - taking your best bud to work with you everyday. So for that I am very grateful to have been given the opportunity. The success and popularity of Jester wouldn’t have been possible without all of his fans. Thanks to everyone that showed your love and support over the last few years. We appreciate it 🖤.